Some of the other photography blogs that I follow participate in Mosaic Monday, and I thought I would give it a try. I love the idea of a mosaic because it is fun to take pictures but, let's be honest, who really wants to look through all 50 pictures that I took of the swans at the park this weekend..... anybody?? That's what I thought. I also found another fun blog called Camera Critters, that fit well with the pictures too. As I mentioned in my mellow Yellow I visited Lake Eola in the heart of downtown Orlando this weekend, and I was shocked at the amount of wildlife that can thrive downtown. Above you will see some of the pictures that I took. Be sure to visit Little Red House to see other Mosaic Monday Entries! Click on the image below to see other critters. Great mosaic! Beautiful birds you captured. That is a beautiful mosaic of beautiful photo's. Compliments. Hi Carly! Your mosaic is gorgeous and those photos are fantastic. You're very good. 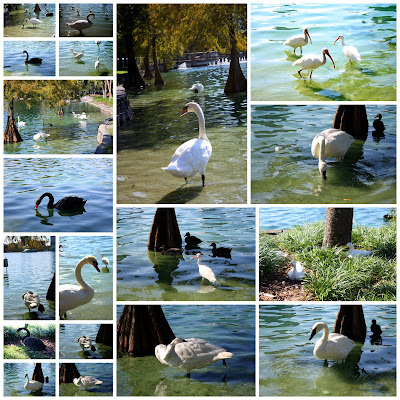 You did a great job of capturing the wildlife at Lake Eola. I have not been there in several months so it was nice to see it through your lens. Thank you for sharing your beautiful mosaic with us. I love swans! I am orginally from SWANSboro, NC...You can imagine how popular swans are! Great mosaic! cool mosaic. i love it! I really love this mosaic! All I can think of is Duck Duck Goose:) Very pretty mosaic.